Thank you for visiting STEADFAST Leadership! My name is Becky Halstead and I am the Founder/CEO of STEADFAST Leadership. If you are seeking to improve yourself—be a better you—and improve your team—more effective, productive and significant, then you have come to the right place. 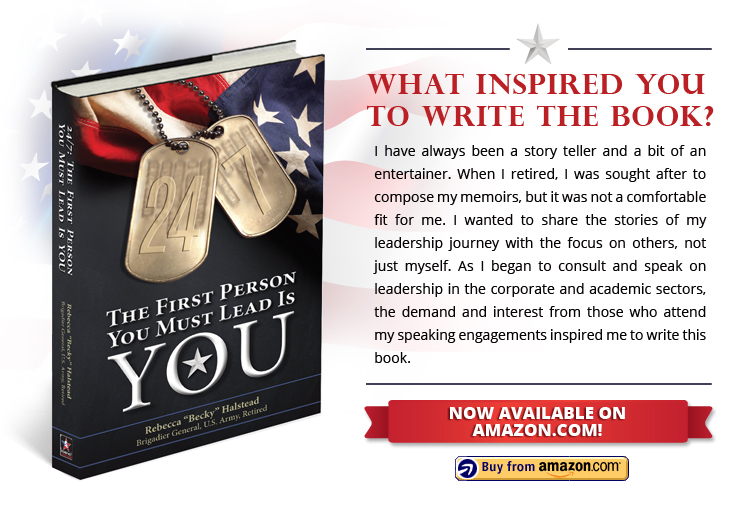 Allow me the opportunity to inspire, educate, and entertain you by sharing my proven leadership philosophy and principles, and experiences—successes and failures—my “war stories”—and my STEADFAST leadership and life principles. My background is uniquely different: from a scrawny kid with buck teeth growing up in a town with no traffic lights, to being in the second class of women to graduate from West Point, achieving General Officer and commanding in combat, and retiring after 27 years. My insights, principles, and tools for success come from practicing LEADERSHIP—not just studying it—for over 40 years. I will help you discover your purpose, your values, and shape your leader behavior. I tailor each of my engagements to meet your intent and your audience. Whether it has been sixth graders attending “Lead America” or CEO’s at a dinner engagement or focus groups, I have consistently received tremendous feedback for being engaging, authentic, humorous, insightful, helpful, and willing to share the good, the bad and the ugly. There will be moments of laughter, tears of conviction, and sometimes dead silence, but you will leave ignited with new purpose. My mission is to inspire and share the message of “The first person you must lead is YOU!”SM and then give you the tools to do it! Leadership is a choice!